All it needs is a few small tweaks. It only took one week for a new battle royale game to become the best esports experience in the genre. The surprise release of Apex Legends and subsequent surge of viewership on Twitch single-handedly raised publisher EA’s stock prices and garnered 10 million players in three days. All of this culminated in Apex Legends’ first tournament, Twitch Rivals, where popular streamers and pro players descended into public servers to wreak havoc in the name of kills and cash prizes. 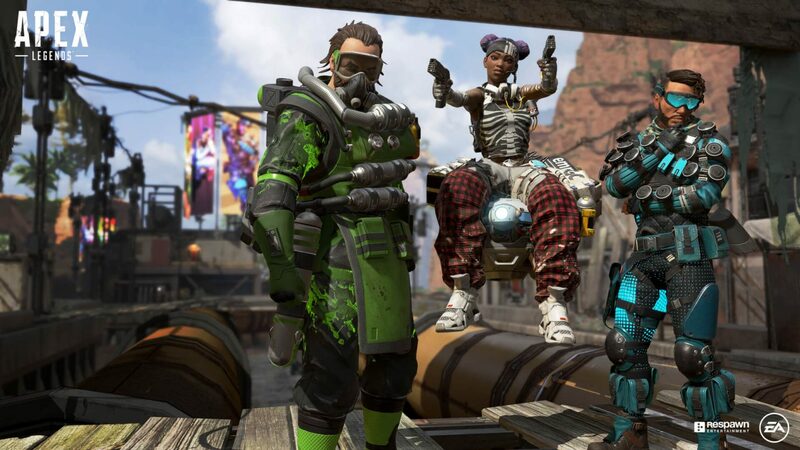 Apex Legends is a great game, and trying to turn it into an esport makes sense. There’s already a massive viewership, with an average of 183,000 viewers and a peak of over 491,000 concurrent viewers on Twitch over the first week of the game leading up to Twitch Rivals (compare that to Fortnite’s 116,000 average and 326,000 peak in the same period). The tournament itself eclipsed the 500,000 mark, with a 568,000 peak in North America, and over 200,000 viewers on Shroud’s channel alone. Apex is different from other BRs. Its classes and better competitive balance, in addition to its eye-catching map and smooth gunplay, make it more interesting for viewers. Battle royale games have made for middling esports titles so far. Apex Legends, with a few more tweaks, could change that. Since the skyrocketing popularity of battle royales took off with H1Z1 in 2016, developers and esports organizers have been trying to figure out how to turn the genre into an esport. Basketball arenas and tennis courts have hosted massive LAN tournaments, with competitors crammed onto the floor, while online tournaments have also taken off. These have proved popular, or at least as popular as the games themselves. The North American and European Fortnite Winter Royales easily eclipsed 300,000 viewers at their respective peaks, while PUBG’s Twitch Rivals Winter Charity Invitational peaked around 72,000. But they’ve also revealed how difficult it can be to watch Battle Royales as a sport. The mad scramble at the beginning of any Battle Royale is the first, very obvious problem. The map is huge, there are 100 players and anywhere from 10 to 20 percent of them die within the first couple minutes. It’s simply impossible to keep track of all of that. The amount of dead space in BRs is also a problem. Chasing the circle chews up time. There are a lot of natural lulls in gameplay as players try to loot and outmaneuver their opponents. And don’t get me started on making sense of a Fortnite tower where four players are simultaneously trying to build each other into a room for an easy kill. These are pivotal parts in Fortnite and PUBG, but they don’t make for easy viewership, and orgs have responded accordingly. The people who get sponsored for playing Fortnite are typically popular streamers and content creators. Sure, they’re great at the game. But TSM or FaZe Clan aren’t paying players to just go to tournaments and win, a la League of Legends or Overwatch League. Streaming and content creation are where the sure money is. Esports-style BR tournaments have been surplus. Apex Legends, on the other hand, is much better-tailored to the esports experience than any BR that’s come before it. The game was already so polished at launch that it’s easy to see how developer Respawn could already throw a successful, high-profile tournament. Esports orgs are already signing players one week into the game’s existence, like former Counter-Strike pro Coby “dizzy” Meadows, who signed with NRG on Feb. 11. A few changes need to be made, however, if the game wants to pursue life as an esport with any longevity. First, Apex deserves private servers for tournaments like these. Watching Shroud brain some schmuck and then trash talk Dr. DisRespect is fun, yes, but it feels like a tease. Of course Shroud is going to waste xXGamerKid69Xx. But I want to see who wins if Shroud and dizzy square off on the field. Maybe Viss or Seagull pop in out of nowhere. Who knows? The game derives its uniqueness in the BR world by way of its classes and team comps. The current Twitch Rivals format makes those classes almost irrelevant because teams farm kills against clearly inferior players. Putting these players into the same server dials the disparity of talent and kill-farming back. The game is fast-paced enough to remain exciting, even if the action has to slow down for a team to work out how to outplay their opponents (as opposed to running up to them solo and killing them without second thought). When everyone on the server is a god, no one is, and that’s when the fun really begins. Second, if a private tournament servers are created, the game needs a spectator system outside of first-person. The first person camera mode is standard in all esports shooters, but the third person mode, especially towards the end of a game, is also important, and something that Apex Legends sorely needs. With it, you can see teams trying to outplay each other and understand better how the game works, like a Bangalore popping smoke at her team’s feet while she’s being rushed and letting her Bloodhound teammate use their ultimate to rip the charging enemy apart. There are a ton of interesting strategies that these character classes open up to players. An improved spectator system will allow viewers to see and appreciate them better. Finally, tournaments should only play a set amount of games. Playing as much as possible in four hours is mad-scramble fun, but also very hard on the players, who really can’t move for those four hours if they have any hope of winning. Shroud publicly broadcast his feelings on the format during the Twitch Rivals stream. “Oh yeah, you’re not gonna be able to [take a break]. I mean you could, it would be like a piss break,” the streamer said. “It’s four hours of intense, focused game time,” replied Shroud’s teammate Skadoodle. “It’s actually kind of fucked up, the format,” Shroud said, before broadcasters quickly switched back to the commentators. But the problem of the format for players was already laid bare. Playing a set amount of games on a private server allows the tournament organizers to set up breaks for players, which can in turn very naturally be used for analysis of games, replays, or advertisements. Twitch Rivals was set up to attract as many viewers as it possibly could, and, between the main stream and all the players’ individual streams, it succeeded in doing that. But Apex Legends could be the standard bearer for battle royales in the esports world with just a few changes. And if Respawn and EA can figure that out, it really does stand a chance at being the game that topples Fortnite.